A table top sale was held in the Church grounds on Saturday 30th July. There were several tables and refreshments were served. A total of £225 was raised. The Sunday School ‘went on holiday’ during July and August and for six weeks we had services with themes and activities to interest the children who joined us for the entire 10am communion service. Our first theme was Mary Magdalene. The children were sent off to search for 10 gold coloured gift bags positioned around the church. The contents contained 10 facts about Mary Magdalene, some well known, some not so. During the next five weeks we learnt about Altars: their history and traditions, the Lectern; St Mary - no gold bags this time and we were rather depleted of children - I only counted three and wondered if Fr Mike had been forewarned of this! The gold bags were back again for week 5 where we studied the Font and learnt that it was originally a bath which stood outside. We finished with St George and the traditional story of how he slayed the Dragon. I found the ‘Summer Break’ services really fun and interesting and thought it must have taken much time and research to make them so good. Our Parish Outing on Tuesday 9th August this year was to the Isle of Wight during Cowes Week. We took the ferry across to Gosport and at 9.30am boarded our boat for the one hour journey to Cowes. When we arrived we all went our separate ways. We browsed in the main street then found a lovely café called Watch House Barn where we had coffee. We liked it so much we returned for lunch and later afternoon tea. In between we walked some more and ‘people watched’ sitting outside the Globe Pub with a cold drink. The weather was warm and sunny and it was a really nice day out. 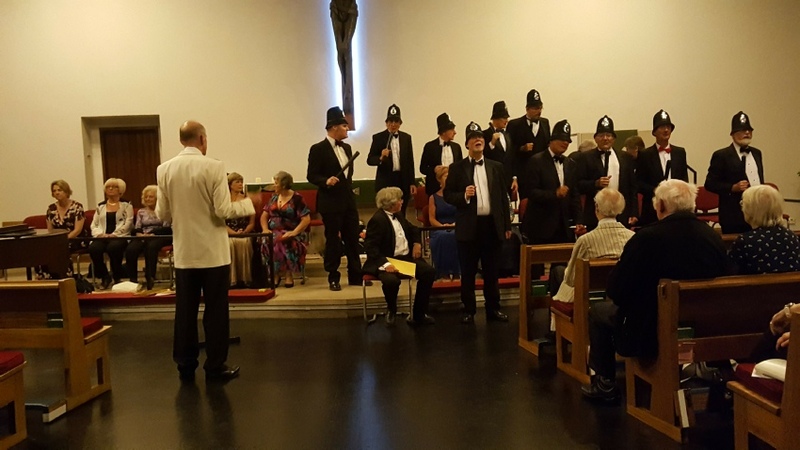 Opera Comique’s 40th Anniversary concert of Gilbert and Sullivan Operettas took place on Saturday 17th September in St George’s Church. Beautiful singing, great piano playing (from Nigel Smith) and some acting too made this an excellent evening of entertainment. It featured two of my favourite G&S Operettas - HMS Pinafore and The Pirates of Penzance. The ‘jam in the sandwich’ so to speak was one I was less familiar with - The Gondoliers. This closed the first half of the concert and brought us to the interval where refreshments were served. The £250 raised was donated to Church funds.